Issues related to the Survivors History Group meeting 31.5.2017 about treasuring people and objects, archives, websites, plaques, museums and art collections. Developed from notes taken by Peter McGeary, Sarah Chaney, Sam Shakes, Katie Gonzalez-Bell and others. Valuing our heritage involves valuing one another. We are our heritage and objects are collected because of their relation to our collective stories. Attended by Andrew Roberts, who runs the Survivors History web, Stephanie Taylor-King (NSUN), Graham Estop (Survivors History Sheffield), Frank Bangay, Nathalie (Nat) Fonnesu, who is planning the Loonies Fest at Kingsley Hall, Peter McGeary (who took notes for the meeting), Fabian Tompsett and Sam Shakes [not Susan] members of Tower Hamlets African and Caribbean Mental Health Organisation and friends of Philip Morgan, Ajay Sawhney, Kerum Wallwork, Anne Plumb (Survivors History archives Manchester), Oisan Wall and Katie Gonzalez-Bell from the Science Museum, Gordon Joly, a member of the Kingsley Hall Heritage Committee, Diana Rose, Professor in User-Led Research at the Institute of Psychiatry, Sarah Chaney. Valuing our heritage involves valuing one another. We are our heritage and objects are collected because of their relation to our collective stories. We treasure those who have "joined our ancestors" and those of us who are still alive. We celebrate with David Kessel, a survivor poet who continues to inspire us in person, and we celebrate Charlotte Mew, a survivor poet who died in 1928. Because we preserve our heritage, Charlotte is still with us. Katie quoted from Sam Shakes that "humanity keeps you well, not the institutions", describing it as an incredibly powerful statement. It shows why several survivor historians have argued for a survivor heritage about survivors - something very different from a museum of asylums and treatments. The meeting on Wednesday 31st May began with an introduction from Fabian and Sam to the "health through history" legacy of Philip Morgan, who popularised the idea of mental well-being built from the image of ourselves gained through studying our collective histories. Fabian, Sam, Gordon, Nat and Andrew joined hundreds of others at Philip's funeral on Thursday 15th June. Sam said that healthy food, humanity, people/relationships - were more important to Philip for mental health than orthodox medicine "love and support is as powerful as medicine". Sydney, a Thachmo colleague and friend of Philip, wrote to Sam that Philip "inspired with his passion, his dedication and determination and was never afraid to speak his mind." Shawna Martini commented "I think this is a true reflection of him". Our discussion turned to what methods we can use to pass on a heritage like Philip's which was embodied in his person and actions. How do we pass on his gifts to assist others to remain healthy? How do we reach people? It was cemented that one of Philip's great strengths was that he reached people at all levels of education or knowledge. One of the reasons Philip is so important is that he talked to everyone. He maintained communication with all he met on how people felt and contributed to the world. 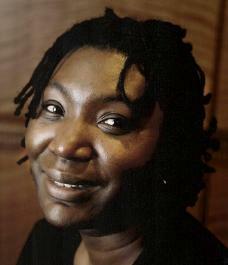 The summer 2017 edition of Asylum contains memories of Patricia Chambers, collated by Jayasree Kalathil who knew Patricia through Catch-A-Fiya (established 2006 by the Afiya Trust, but now closed) which establish supportive links (networks) between survivors who identify as black or minority ethnic. In 1996 Patricia's personal experiences led her to conduct her own research into "different ways, pathways or reasons that young black men were coming into the mental health system". This led to a research career noted for down to earth common sense, and to her becoming manager of Catch- A-Fiya in 2009. Patricia's legacy includes an approach to research that we can all relate to, and a demonstration of the value of supportive relations between survivors through different networks. Her death brought home to people the importance of restoring and maintaining the networks that have been lost and creating new ones to. Sarah Chaney, author of the Wellcome Library article (15.12.2016) "Where is the survivor archive?" then spoke and led discussion. Sarah said she had recently been asked to fill in an occupational health form for a new job. One question asked "Have you ever seen a psychiatrist, and if so what was the outcome?" She wanted to write, "The outcome was I became a historian." She spoke about the importance of history for understanding ourselves and the past, but also for critique of medicine/orthodox view. Sarah said she had worked in medical museums and archives for about twelve years, including at the Bethlem Museum of the Mind. This, she said, "is not really a museum of the mind - it's a museum of psychiatry". It is very focused on a medical model - understandable, perhaps, given the collection has been put together by a hospital. The survivor perspective is easily omitted from museums and histories made and written by people who provide care and control. Sarah's PhD, focused on late Victorian psychiatry and self-inflicted injury. Researching it, she read patient records for the Bethlem Royal Hospital. Here she came across a patient called Walter Abraham Haigh, and a brief mention in the notes that he had been helping Dr Savage with his manual on insanity. She checked the front of Savage's textbook, where he acknowledged just two people for help - one was Mr W.A. Haigh. Now, most people would have no idea that Haigh was a patient at Bethlem, so as in many other places in psychiatric history the survivor story is buried within the orthodox view. It is easy for survivor narratives to get left out of the official story. Fabian told us of the vision of a survivor archive that has developed out of discussions between survivor historians over many years. These discussions have mainly taken place at meetings of ~~ and at London meetings of the Survivor History Group. The vision is not of a centralised archive, but of creating small satellite paper archive collections in various places in the country, linked by one or more websites which would also include a digitised archive online. Something like this has been developed using the Survivor's History website. Well developed satellite archives exist in individual's houses, such as the collection of Anne Plumb in Manchester, Terry Simpson in Leeds and Peter Campbell and Andrew Roberts in London. There are also archives maintained by survivor organisations in Toronto (Canada), Edinburgh (Scotland) and Birmingham. Proposals exist to transfer the personal archives to institutions. Bishopsgate Institute has agreed to preserve the archive from Andrew and Peter's house, and also to preserve the website. But there's so many survivor collections or things within other collections out there. So how do we find them all? 2) Who collects survivor material and why? WHERE SHOULD PERSONAL ARCHIVES GO? Fabian spoke of his work with Wikipedia - All need to be editors! Internet - Online - Things can disappear. Preserving dialogues - Different experiences and priorities. Sam: Hard to collect survivor stories because people fear repercussions, especially if currently undergoing treatment (this happened at Bethlem in a project). Stories should be collected outside hospital/institutional environment. Anne: It is important to distinguish between a loan of a record/artefact and a donation. When asking for archives to be preserves, identify that records are s a 'loan' and specify conditions in which they can be used. A donation need not be returned and can otherwise be used by the institution for its own purposes. Patient/service user narratives can get lost in statistics. The official story reads that, e.g. 54% of people thought such and such. But what of the other 46%? And do the questions asked really represent their thoughts anyway? Used to support the status quo. Sam: Service users may not get credit for their role. Anne: Institutions set the status quo through power/funding. Some of this may come from medical background (e.g. Wellcome Library, trust still has medical remit). Diana: Can we change these institutions by working within them? Katie: E.g. curating exhibitions at Science Museum. A group can come in and decide how a story is told and what is used. Katie: - It's important for museums to recognise that there is not only one survivor history, there are many. There is not just one history! Institutions - e.g. hospitals, medical organisations. Their collecting policies tend to focus on the institution or profession they represent. Survivor archives are not so closely tied to a specific organisation, so might not fit the remit. Material also interpreted from medical perspective. Local Studies/Records - e.g. Manchester. When the 'Oor Mad Histories' documents were sent to Lothian Health Archives they were much harder to access (Anne). Patient records and personal material the first thing to be disposed of if lack of space/funding (e.g. Preston Record Office only kept 1 in 10 of historic records from Whittingham Hospital). Wellcome Library. Tend to keep the official story. Wellcome Library claimed years ago they were trying to expand the number of service user stories in their mental health collections but have not done much (hence Sarah's blog!). Also interpretation can be a problem - tend towards supporting/reinforcing a medical view and assume this is obvious or the only perspective. "Who is the 'we' in the Science Museum?" Charities. Have a specific remit, usually collecting things directly related to charity/campaigns. Community Groups, e.g. Oor Mad Histories (Edinburgh project). Can access small amounts of funding and create catalogued archive but what happens in the long-term? Personal collections - Scan/Digitise. Should individuals be scanning, or pay to have this done? Could it be paid for as part of a project? Where would scans go? Andrew's website/Wikipedia - use existing resources. It is important to collect and preserve, make sure stories and material is not lost to future generations so they are unaware of the survivor/service user movement's legacy. A survivor archive would be very different from existing official archives - focused on people, stories, experiences and campaigns/groups/movements rather than on institutions and medicine (like the official story is). The question of where to collect things and how it should be managed remains! Katie outlined the project, based on Henry Wellcome's collection. The Medical Galleries will open in 2019 and cover the entire first floor of the museum, with over 2000+ objects. There will be five zones. Each section covers various topics, and Katie is focusing on the last one, in particular a strand on the closure of the asylums and introduction of care in the community. Katie said that people should be involved in curating their own histories and experiences in major museums like the Science Museum, as well as in specifically survivor heritage projects. People should have a say over how their own story is portrayed. She is looking to recruit a small group of people who have experience of the old asylum system. They will spend sessions (6 sessions in June and July) working with Science Museum staff to agree what's important to include (or not) and may co-produce a film. In particular, the group are to decide what are the key messages to tell visitors in the galleries. They won't be collecting new items but working with current Science Museum collection, which includes items from the old asylums. Sarah asked if this was about re-interpreting the collections, much of which has quite a normative medical interpretation in catalogues. (Sarah was not very clear how much this would be the case from Katie's answer though!). Katie argued that it is important for museums to recognise that there are many survivor histories - not just one. Anne expressed concern about the idea of this [what?] being a pleasant experience (as Katie described it) - it is important to convey outrage. Sam raised the issue of consultancy fees. Katie confirmed participants would not be paid, but reimbursed for travel and given refreshments. She said it was a condition of their funders that in co-production the museum works with volunteers. Sarah said that some projects do pay experts from experience for their involvement - for example the Re-framing Disability exhibition at the Royal College of Physicians paid disabled people for their time (funded by Wellcome Trust). Katie said they were unable to follow this model but she did know of it. Someone (may have been Sam or Anne) also raised the issue of long-term relationships - these short projects end and lead to people feeling disempowered or disillusioned about their relationship with the museum. Katie said there may be further opportunities in galleries, but this project is certainly not a long-term relationship with Science Museum. Andrew stressed that the Science Museum has a responsibility to ensure diversity, meaning actively soliciting people and not just relying on those who volunteer. (see the absence of black service users in the Bethlem Museum). Need for some form of collective assurance (not sure who said that). Sam stressed that payment helps to ensure representation. LOONIES FEST AT KINGSLEY HALL - MARY BARNES - F.E.E.L. FRIENDS OF EAST END LOONIES. Nat says "We are celebrating 10 years since our collective of the Friends of East End Loonies (F.E.E.L.) got together for the first time in November 2007" "taking the chance to celebrate and honouring people's lunacy, creativity and individuality". It has been suggested by some members of the Survivors History Group that Kingsley Hall Bow should become a Survivor Heritage Site, in commemoration of the artist Mary Barnes, who lived there, and celebration of Friends of East End Loonies, who hold their large meetings there. Amongst these was "A Pageant of Survivor History - Mental patients in poetry, story and song from the 18th to 21st century", performed by F.E.E.L. members and others in March 2010. Kingsley Hall, Powis Road, Bow, was opened on 15.9.1928 as the new home for the East End social centre established by two Baptist sisters, Muriel and Doris Lester. The building has a clubroom and dining room, kitchen, office and a space of worship and some residential units or "cells". Mahatma Gandhi stayed in one of these cells for 12 weeks in 1931. They were also used by hunger marchers in 1935. Today there is a bust of Gandhi in the hall, a blue plaque to him on the wall, and the Gandhi Foundation occupies the calls. Sidney Briskin, a patient of the psychiatrist Ronald Laing, established a community of young people diagnosed as schizophrenic in his home in Willifield Way, NW11. He became the dynamic behind a group called the Philadelphia Association, which included Laing, and secured Kingsley Hall on a nominal rent as the home for a larger community for five years (1965- 1970). The Kingsley Hall Asylum was often "hell" (Mary Barnes), but Sidney was "a rock of stability in turbulent times". So, there was a community centre waiting for something to be done with it and one woman who knew what that something should be. Over Whitsun (6.6.1965) weekend, Mary Barnes moved in, with Sidney's permission, to set up what she thought would be a democratic community. She was soon disillusioned about the democracy, but remained at the centre of the community until she was the only on left in 1970 and had to find somewhere else to live. In the five years she had come close to death and, during her recovery, had discovered her genius for expressing her emotions in paintings all over Kingsley Hall. Gordon Joly, a member of Kingsley Hall, and a volunteer guide and organiser for London Open House for Kingsley Hall for over ten years, spoke to us about these issues. Andrew and others have suggested that a Blue Plaque for Mary Barnes should be next to the one for Gandhi. Gordon pointed out that many people wanted a Blue Plaque for Muriel and Doris Lester on the building. Gordon told us that it was at the 2006 London Open House that the late Sidney Briskin donated a Mary Barnes painting. This picture is not on display, but Gordon has made a photograph of it available on the web. The picture itself is one of many items held by David Baker, the Centre Manager, at Kingsley Hall relating to the Mary Barnes period (1965-1970). Kingsley Hall is not an open space, such as a library. If Kingsley Hall had material about Mary Barnes on display, Gordon suggested, it would only be seen at events such as London Open House. Mary's psychiatrist, Joe Berke, has a large amount of Mary Barnes work, and he has worked with Bow Arts in the past. There have also been events elsewhere. Joe Berke maintains a website about Mary Barnes and links to this and other sites will be found on the Survivors History web under Kingsley Hall. Gordon is of the opinion that "Blue Plaques" are a very 20th Century way to remember people. He has put material onto "Commons" (part of the Wikipedia project suite) so that the whole world can be aware of Mary Barnes. F.E.E.L. FRIENDS OF EAST END LOONIES. The Loonies Fest will "remember the old St Clements Hospital ... that brought us Loonies together". Myra Garrett chaired the Friends of St Clements which was formed in 1987. The Friends brought patients, friends, families and staff together to discuss what was beneficial and what was harmful in hospital practices. In 1992 the Friends established a social club that met in Wandsworth Stanley Hall and a creative writing group started publishing its journal in 1995. St Clements closed in 2007 and there was an extended period of discussion about what should happen to the Friends. David Kessel repeatedly suggested that what was needed was not a friends of a hospital but a Friends of East End Loonies. Eventually he got his way and F.E.E.L. met for the first time in November 2007.